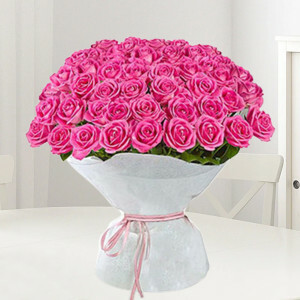 Wish the important people in your lives, very happy birthday with these refreshingly beautiful flowers by MyFlowerApp. Buy and send flowers online, and we will deliver, free of shipping, anywhere in India. 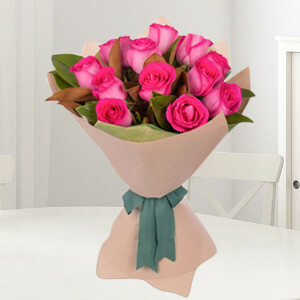 Celebrate their special day, even if you are far away and wish them at 12:00 dot, with our midnight delivery service. 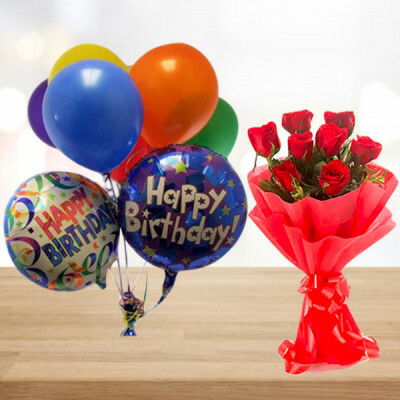 Bouquet of 10 Red Roses with 8 Balloons. 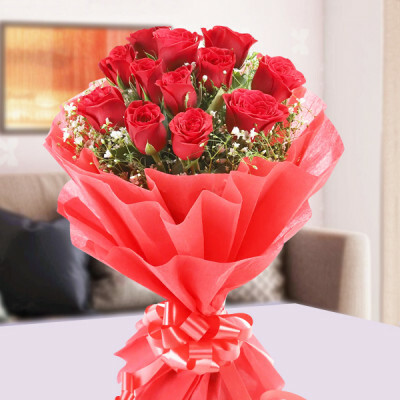 Bouquet of 12 Red Roses in paper packing with 7 Balloons. 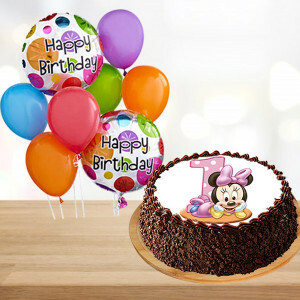 1 Kg Chocolate photo cake and 7 balloons. Half Kg pineapple cake and 8 balloons. 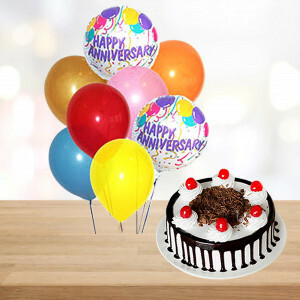 Half Kg black forest cake and 8 balloons. 1 Kg Doremon Vanilla Cake and 8 Ballons. 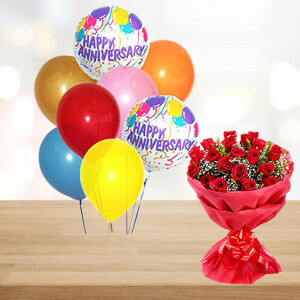 Bouquet of 10 Mix Roses with 7 Balloons. Half Kg Chocolate cake and 7 balloons. The day one is born is a very special day, in anyone’s life. Celebrating our birthday is important to all of us. 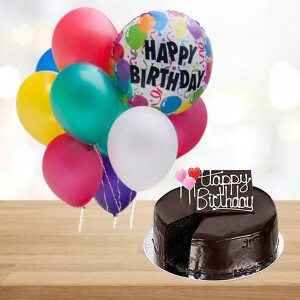 However, deciding on a gift for the Birthday boy or girl is an absolute chore at times, and even more troublesome is sending the birthday gift to our dear ones far away. MyFlowerApp brings to you, a solution to both the problems in one go. 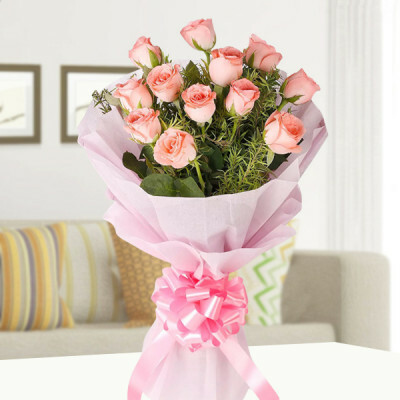 Buy gifts online for your dear ones, from our notable repertoire of gorgeous flowers, personalized gifts, cakes, chocolates, and more, and send them anywhere in India, with our dependable delivery services. 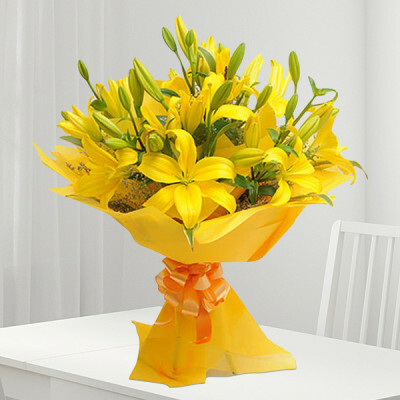 We offer fresh, handpicked flowers arranged in elegant designs by expert florists, personalized gifts made to suit every relation, delicious Birthday Cakes in every flavor and design, and so much more. Simply choose from a plethora of choice, and get them delivered anywhere in India. “The greatest gift that you can give to others is the gift of unconditional love and acceptance.” While that is true, however, you do need to get your dear ones a proper gift, especially on their special day. Yet, deciding on a gift is one of the hardest decisions, especially for the guys in our life. 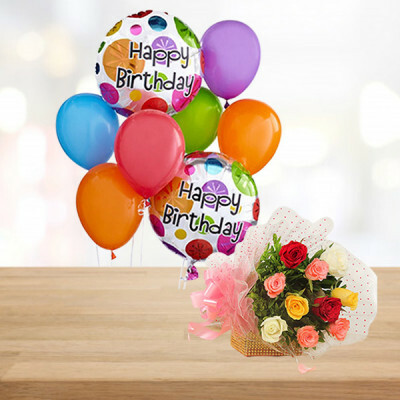 MyFlowerApp has the option of Birthday Gifts for Him, for the time you are stuck in a snag, deciding on what to get your brother, father,husband, boyfriend, friend, or anyone else important to you. 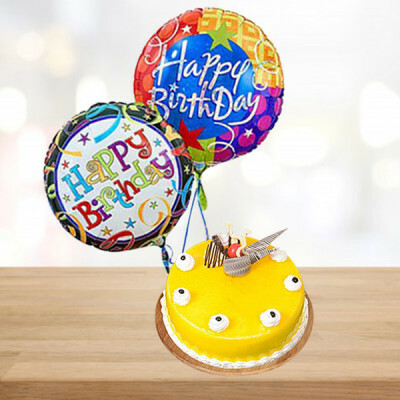 You can choose from a large variety of Birthday Gifts, cakes, flowers, and more, and send it to them online, with our express delivery. Select a personalized gift, or make it a combo with Flowers N Chocolates or choose from our various Combo Gifts and send it to them, anywhere in India. Woman: Without her, man is nothing. The world is nothing. Therefore, to bring joy to the women in your life, on their special day, MyFlowerApp has gathered, a variety of Birthday Gifts for Her, many, personalized for every relation. If you are unable to decide what to get your mother, sister, wife, girlfriend, friend, or any other lady, on her birthday, simply move to the Gifts for Her category, and choose from our assorted selection. 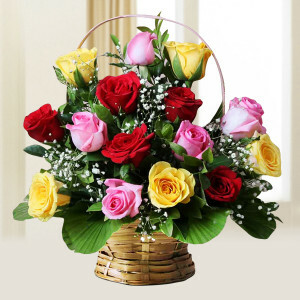 You can either send her roses – the best fallback option when you are confused, or send her a gorgeous bouquet of her favorite flowers, as Birthday Flowers are one of the best and most eloquent gifts ever. Send photo frames, teddy bears, soft toys, key chains, mugs, and more. You can even make it a combo by sending Flowers N Cakes, to make the surprise extra special. Select from a wide range of different Birthday Cakes – eggless cakes, designer cakes, birthday photo cakes, chocolate cakes, and more and get them delivered, directly to her doorstep, with our express delivery services. Cherish all your happy moments with your parents; they make a fine cushion for old age. We are nothing without our parents, and our relationship with them is completely emotional, with no place for logic. Celebrate their birthday, even if you cannot be with them on their special day, with online delivery by MyFlowerApp. Send your love to your mom with gorgeous flowers along with one of our amazing combo gifts from the Birthday Gifts for Parents range, or send your dad his favorite chocolates along with a personalized gift. You will find gifts that may suit your parents’ personality or something related to their hobbies with us. Does your mom love getting her selfies clicked? Get her one of our personalized photo frames. Is your father an amazing cook and loves working in the kitchen? Get him of these personalized aprons. On the other hand, if you cannot decide, settle on Birthday Cakes – the best option other than flowers. More than the cost, focus on the emotions behind the gift you send. You will also find Sugar-free cakes for diabetic or dieting people. “Each day of our lives, we make deposits in the memory banks of our children.” Deposit some amazing memories, by celebrating your kids’ birthdays with much zeal and fun. Our children are one of the most important parts of our lives – they are a part of us. Watching them grow up and documenting the special moments is important to us. Make their special day even better with amazing gifts, flowers, chocolates, and cakes, from MyFlowerApp’s Birthday Gifts for Kids range. 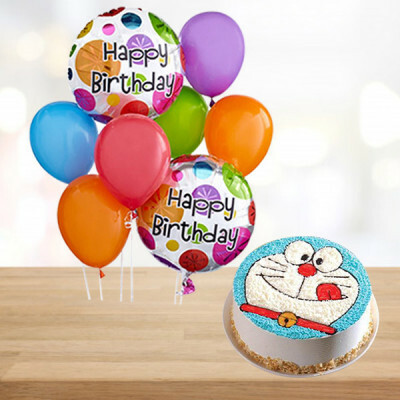 Get your princess or your darling boy their favorite Doraemon cake, or Minion cake, or shop for return gifts for their amazing birthday party. The first birthday of their baby is always one of the most important milestones for any parents. Celebrate it with much ado or find adorable gifts to send to your dear ones on their baby’s first birthday. Be it the sweet sixteenth, or the stepping stone of becoming an adult – the 18th birthday – celebrate the day, just how they like it, and choose a gift or cake that suits their personality and the occasion preeminently. In our hectic lifestyles, we often get our days mixed up, realizing at the last moment that today is the birthday of your dear one. Or maybe, you could not come to a decision on what to get them and procrastinated. Well, you do not need to worry about sending a gift. Simply select a personalized gift, a combo, flowers, chocolates, or cake for your dear one, and select same day delivery service and we will deliver anywhere in India, within 3 hours. Whether you pick a designer cake or a simple flavored one, like pineapple, butterscotch, vanilla, strawberry, mango, etc., your package will be delivered anywhere in India, within the allocated time, along with any and all add-ons that you may have selected. A birthday means celebrating the presence of an individual in our lives. 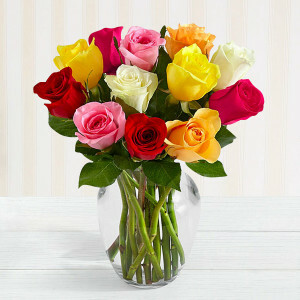 Make the special day of your dearly loved ones, happier and full of joy with MyFlowerApp’s midnight delivery services. Send their favorite cake, flowers, chocolates, gifts, or a combo of these, directly to their doorstep right as the clock chimes twelve. 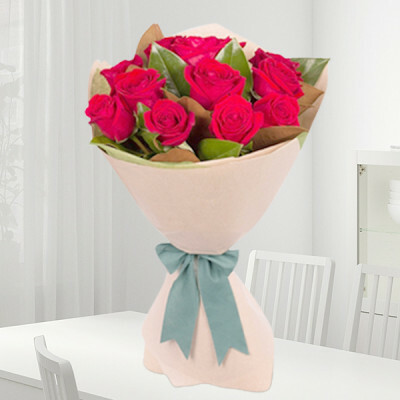 Fill the rest of their day with smiles and elation, as you become the first person to wish them, with your timely delivery. 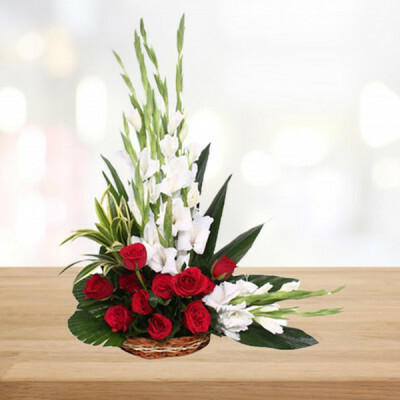 Send them their favorite roses, lilies, gerberas, carnations, and more arranged in gorgeous designs, along with their favorite cakes from our Flowers n Cakes combo and make their day extra special.